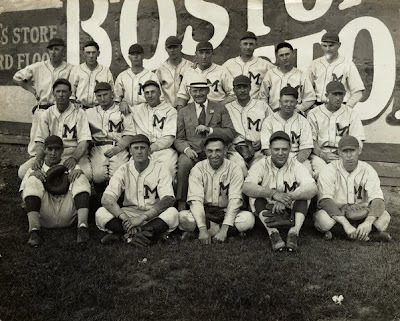 Here's another good look at Milwaukee's original "Team Streak", the 1926 club which won 21 games in a row. The Milwaukee baseball team which is leading the American Association has set a record with 21 consecutive wins. They are left to right, standing: Coggin, Clyde Beck, Al Reitz, Sylvester Simon, Frank Luce, Roy Saunders, Harry Strohm, and Fred Schulte. Left to right, seated, Lloyd Flippin, Joe Eddelman, Jack Lelivelt, manager, Otto Borchert, president, Bunny Brief, Denny Gearin, and Ivy Griffin. In the foreground, left to right, Russ Young, Ossie Orwoll, Lance Richbourg, Ed Stauffer and Bob McMenem. Marvelous Borchert Field wall ad for Boston Store. And it's always good to see a picture of Otto Borchert, who would pass away less than a year later, on the eve of the 1927 season. The Brewers got their 21st win at Borchert Field on June 14th against the Toledo Mud Hens, under future Milwaukee skipper Casey Stengel. The Brews came out strong, scoring six runs in the bottom of the first inning on their way to a 9-0 rout. The start of the avalanche of runs which gave those galloping Brewers promise of making it 21 straight out at Athletic Park Tuesday afternoon is depicted in the picture above, caught by The Journal's long-range cameraman during the first inning. 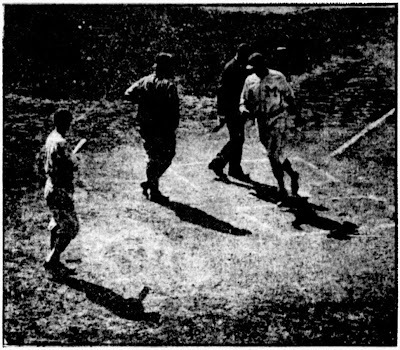 It shows Schulte crossing the plate after lifting a home run over the left field fence, scoring Richbourg ahead of him. Griffin is seen looking on, bat in hand, with Heving, Toledo catcher, and Umpire Connolly among the other nearby spectators. The rest of the season wasn't as successful for the Brews, as nearly a quarter of their wins came during the remarkable streak. They finished 1926 at 93-71, a respectable record well short of the American Association pace, putting them in third behind the Louisville Colonels (105-62) and Indianapolis Indians (94-71).